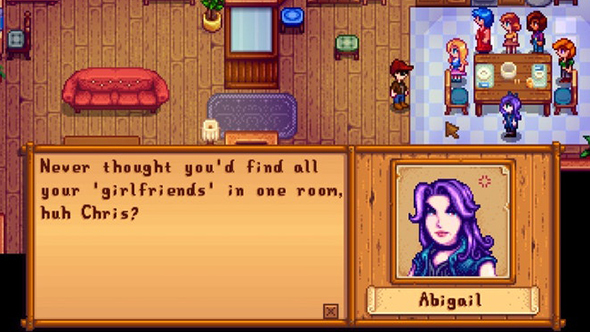 We all have our favourite picks among Stardew Valley’s selection of eligible singles, but who here hasn’t gone and romanced every boyfriend and/or girlfriend available in an effort to see what happens? Up until this point, your numerous beaus were pretty tolerant of you dating around, but that’s set to change in the game’s 1.3 update. Check out what to expect from Stardew Valley multiplayer. Amorous players on Reddit who’ve loaded the beta update have occasionally found themselves met with tribunals of angry boyfriends and girlfriends, as Polygon have noted. The event seems to trigger if you’re unmarried and have reached 10 hearts will all available dating options, at which point you’ll face either the boys down at the saloon or the girls at Haley’s house. After hitting one of those events, everyone will drop to 8/10 hearts and your former lovers will have some nasty words for you as you meet them around town. It seems you’re safe if you’ve only got some of those romance options maxed out, so you may want to avoid getting too friendly with everyone who’s around. Of course, if you’re looking to continue a fully polyamorous lifestyle, I’m sure somebody’s already hard at work on a mod to accommodate you. The 1.3 update is currently available primarily as a multiplayer beta, and everyone’s still trying to piece together all the new features across the game.